My first set of shadow weave samples is off the loom. I don't have anything profound to report, but weaving these has given me an opportunity to do some experimenting as well as get a feel for it and an idea of what to consider next. I wove three identical strips of five samples each, choosing different sizes of yarn for each sample strip. In my stash, I found the following of similar color: 8/2 cotton, sock yarn, worsted weight knitting yarn. This gave me an opportunity to experiment with sett as well as yarn size. The draft (profile actually) was taken from Marian Powell’s 1000+ Patterns. I started with the 4-1 threading on page 66. 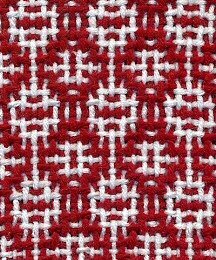 This is a 4 shaft shadow weave in point twill development. 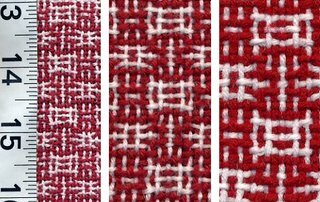 I chose five different treadling sequences to weave the strips, using the same sequences for each strip. 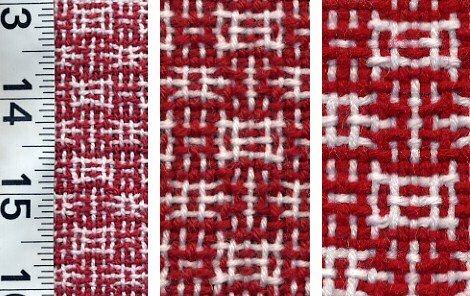 I found that the best way to interpret these was to work them out as a more familiar drawdown on my simple weaving software program, WinWeave. I also discovered how easy it is to make treadling errors! Can you see it? Now, on to weaving more samples. I think I have fabric envy! Love your blog, I learn something new each time I visit! Very nice samples, Leigh. 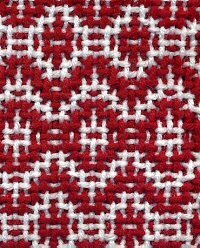 The red and white look very Scandinavian to me. Once you get the hang of profile drafts, they can be a lot of fun to play with. Love the samples. 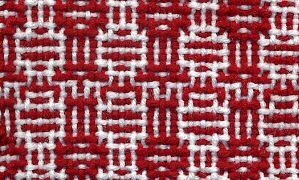 I hope my weaving looks that good someday! I skip your blog for a day or two and wow!! You do make time to eat, don't you???? I use the sewing thread after a treadling sequence as well. It really really helps, as you have discovered. 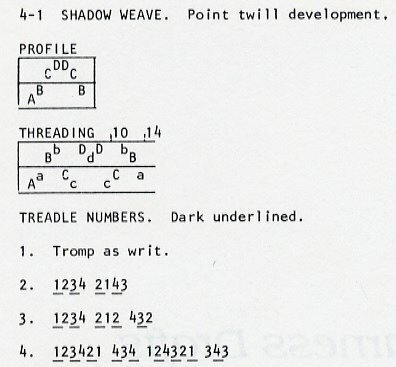 Putting the info in your weaving program was a good idea. I always just sweat it out with my not-so-smart brain and wonder why I kill myself over this. Great samples! Now you have me thinking about shadow weave! I like your samples and I think you're an example for sampling(grin) Only in extreme unction cases I'll be able to sample. 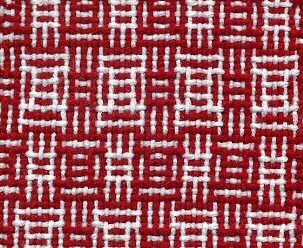 Your blog is about weaving,something really refreshing when it seems that there's no other thing in the world except quilting.